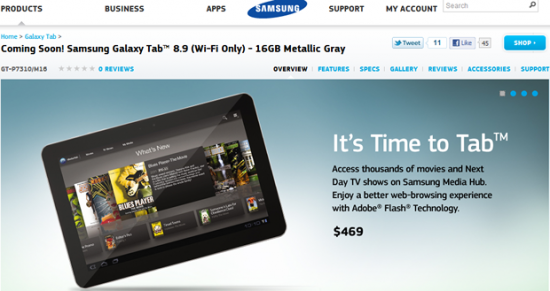 The Samsung Galaxy Tab 8.9 at Best Buy on the 27th? Looks like it. Samsung is the company to keep an eye on. I know all of you Apple lovers don’t pay them any mind. Apple’s mind on the other hand has been on Samsung and vice-versa, just check German court records. If you didn’t know Apple has successfully buried the Samsung Galaxy Tab 10.1, keeping it out of consumers hands. Samsung has returned the legal elbow by alleging Apple stole the brain rather than the design which is Apple’s grievance. Samsung is still moving their product with no hesitation, and now it looks like their latest release, the Samsung Galaxy Tab 8.9. The exact date has been a great teaser, first Best Buy said the 22nd, that didn’t happen. Thanks to our friends at netbooknews.com we have the date. This Tuesday the 27th is the date the tablets are slated to be in stock. More specifically, the South San Francisco store location was sscheduled to receive three via Fed Ex delivery. I’d suggest calling your local Best Buy and simply ask, you don’t know until you do. There will be display items sold more than likely and of course you can just order one online, check out the link under the video. It’s from Best Buy naturally but unfortunately its for pre-order. Video has misinformation. The 8.9 has the same processor as the 10.1 (1ghz dual core, not 1.5ghz). So either he doesn’t know what he’s talking about, or they changed the specs between pre-production and now.